It’s not often that we’re asked to relaunch an advanced medical technology as a consumer-facing brand. But that’s what Bovie Medical challenged us to do with their proprietary J-Plasma® energy platform. Bovie realized that the same properties of precision and gentleness that made J-Plasma a trusted technology for medical procedures gave it huge potential in cosmetic surgery. But the J-Plasma name didn’t resonate with plastic or cosmetic physicians or their consumers. With that in mind, the product was renamed Renuvion™ Cosmetic Technology for marketing in the cosmetic space, and we were tasked with launching it. Because cosmetic surgery was new territory for Bovie, it was crucial to rigorously test positioning, messaging and creative with the targeted physicians. Validated by the audience, “Reshaping What’s Possible” became the brand’s unifying idea and rallying cry, speaking to procedural potential, transforming surgical capabilities, patient expectations and practice growth. The task with creating the brand was to balance the worlds of science and beauty. The logo we arrived at was chosen because it achieves that science-aesthetic meld. After testing creative options in the marketplace, we selected a brand look and feel that combines aspirational beauty imagery with a color palette and graphic elements that suggest energy, technology and innovation. 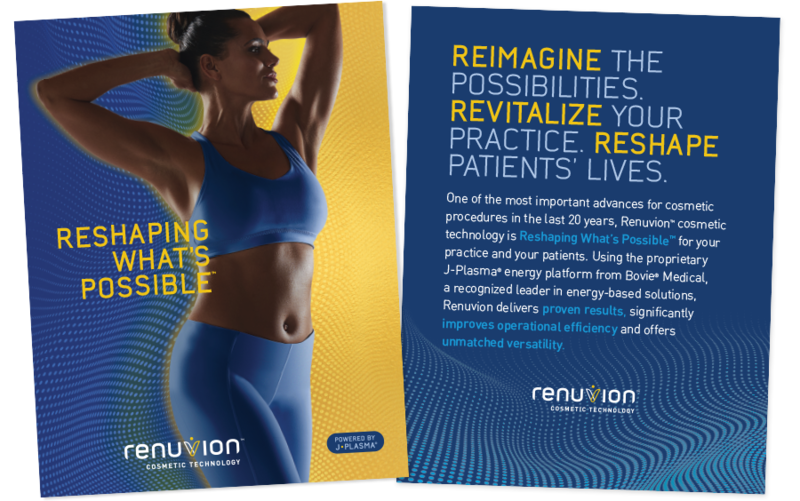 Today plastic and cosmetic physicians are rapidly adopting Renuvion cosmetic technology, and the new brand name is quickly gaining traction in the marketplace. In upcoming months, we will be working with Bovie to introduce this technology to consumers, so they can begin Reshaping What’s Possible.